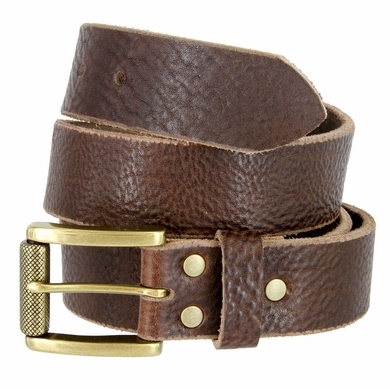 Hand Crafted in Anaheim California USA, Made of North American Full Grain Cowhide, Drum Dyed for lasting beauty accented with High quality, Heavy Antique Brass finish roller buckle on 1-1/2" (38mm) wide 4. 90 mm approximately . (3/16" approximately . ) thickness One Piece Genuine Full Grain Leather Belt.